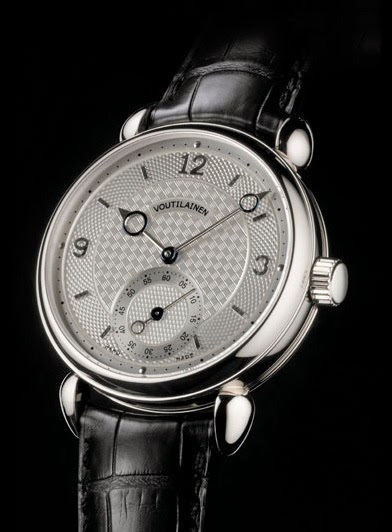 During my ‘investigation’ for the Voutilainen Chronograph I stopped at some point and asked myself what is Mr. Voutilainen wearing at his wrist during the day. And if he likes watches (judging by his career pick), more than sure he has preferences. So I decided to ask him and Mr. Voutilainen responded. I would like to thank him for his time and answers. Q: What watch do you have on the wrist every day? Q: On your own personal watch collection, which is your favourite? Or, if you still don’t have it, what are you dreaming of? The Voutilainen Vingt-8 (calibre 28) is an in-house movement designed, build, fabricated, finished and assembled in the Voutilainen workshop. The dial in silver, hand turned guilloche, has central hours and minutes and seconds at 6 o’clock with hands in gold and steel. The dial features 3 patterns offering great pleasure to the eyes of the watcher. The 39mm case (in platinum or gold) is build and designed to keep safe the 30mm movement build also to be robust. 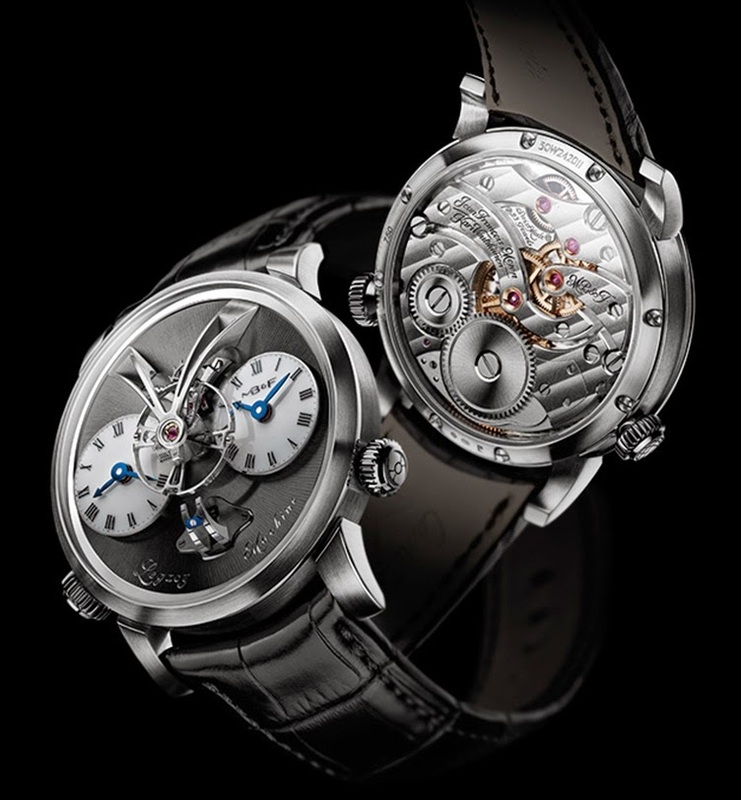 The calibre 28 features two escapements wheels (the blue steel wheels under the balance) that power a very big balance wheel (13.6mm with Breguet spring). The entire system is more efficient and stable for the daily usage since this escapement requires less energy as the traditional type. The watch is rich in details: movement with silver bridges with round, well polished, edges and gold plated wheels, dial filled in patterns split in 3 zones with gold applied numerals, the simplicity and beauty of the hands – a beauty and a beast at the same time. 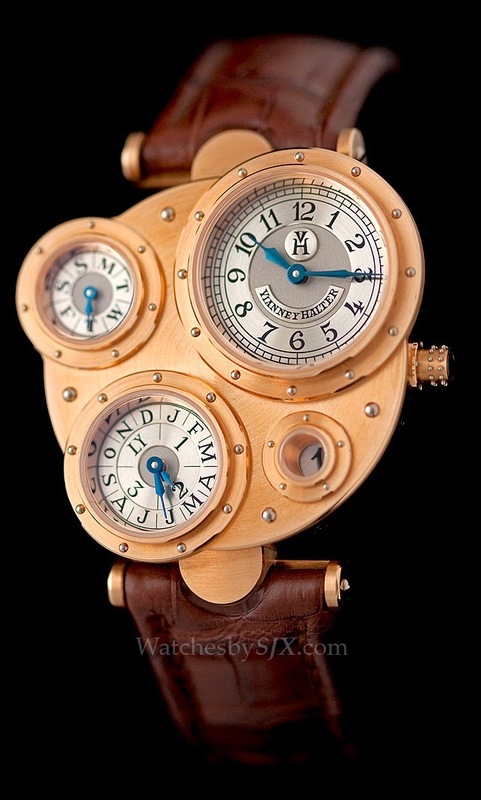 The MB&F Legacy machine is something different. Born in the dreams of Maximilian Büsser (http://mbandf.com/mbandf/mbandf/), fantasising about the future and the past. The most impressive feature of this watch is the position of the balance wheel – above everything else. The LM1 is a collective effort of Jean-François Mojon (calibre development) and Kari Voutilainen (aesthetic design and fine finishing). 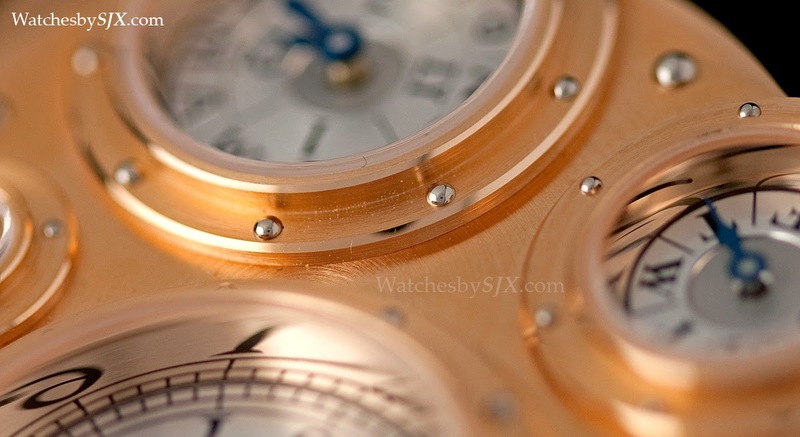 The case in gold (white or red) or platinum has 44mm and, including the sapphire crystal dome, the height is 16mm. The heart of this movement beats with 18000 vph with the help of a Breguet spring mounted on a 14mm balance wheel suspended over the dials. LM1 has 45h power reserve, 279 components and 23 jewels. The crystal dome has anti reflective coating on both sides. The machine has two independent time zones dials, 2 crowns, at 4 o’clock (time and winding) and at 8 o’clock (time) and a unique way of displaying the power reserve – vertical mode (just like a canon prepared to release his full power). 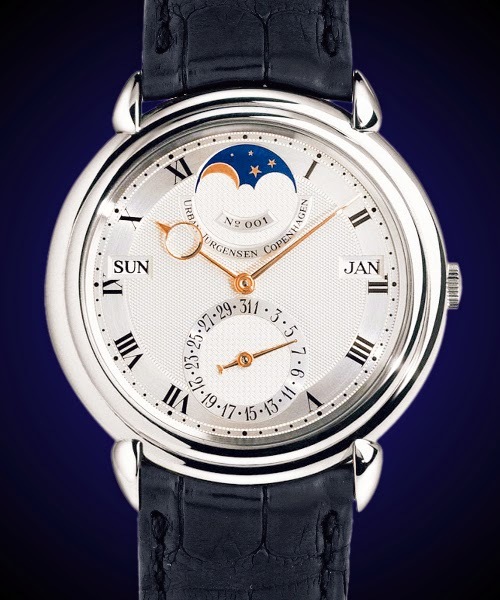 The Urban Jürgensen Perpetual Calendar is a beautiful watch, well proportioned and originated from Copenhagen. The 38mm case contains a perpetual calendar in a 2.4mm thin calibre – FP71. That is thin! This watch manufactured in the traditional way is offered in white gold, yellow gold or platinum and features a beautiful moon-phase at 12 o’clock, date at 6 o’clock and date and month at 9 and respectively 3 o’clock. This is, in my opinion, one of the most beautiful dial layout. 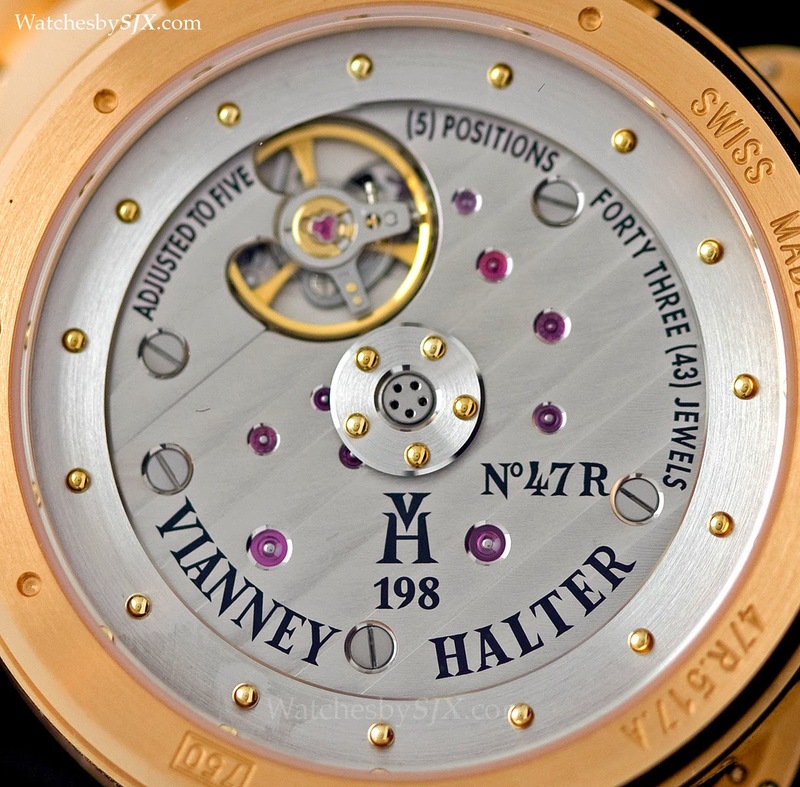 The Vianney Halter Antiqua Perpetual Calendar is one of the best examples of craftsmanship. The details are everywhere, overwhelming for an advised eye. The combination of brushed and polished finishes is found everywhere and the shape of the watch is unusual. The mirror-polished parts and the brushed ones create a depth effect making the dials to be more important than the rest of the watch. Your eyes are running from dial to dial, being hard to look at other details without ‘feeling’ the dial’s presence. The black enamel filling for the letters and numbers (hand engraved before) also creates a nice contrast, making the dials easier to read. Don’t get me wrong – when you have so many beautiful details and finishes you need something to anchor yourself to. The perpetual calender features hours and minutes in one dial, months and years in another, day and date in other two individual ‘windows’. The way that the dial mirrors itself in the flanks emphasizes its beauty and importance. In this case, the devil is in the detail’s detail. 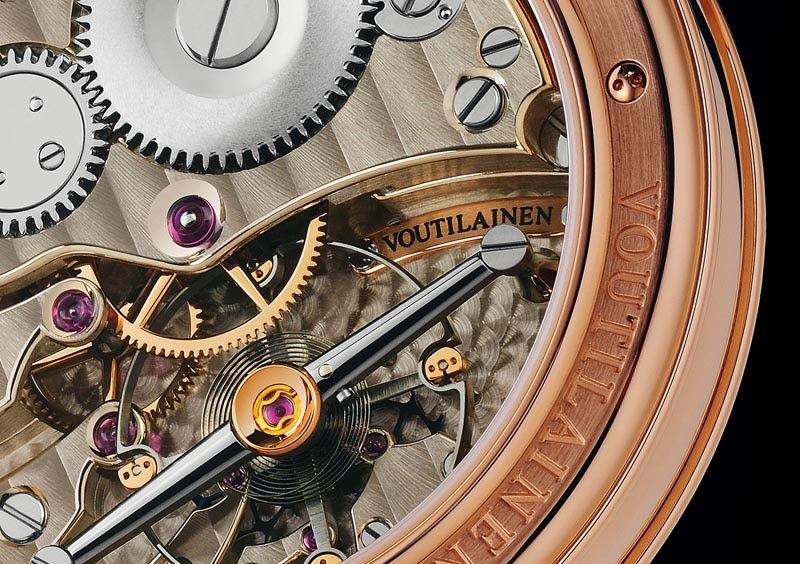 The back side of the Antiqua is equally full of details and, starting with the crown (24 gold rivets inserted in a drilled tube), continuing with the shape of the case and all the small elements, it is a masterpiece and I can fully understand the wish of Mr. Voutilainen to own one. The pictures of Antiqua were taken from: http://www.watchesbysjx.com/2011/04/look-at-creations-of-vianney-halter.html and I would like to thank Su Jia Xian for letting me use these pictures from his blog (Thank you, SJX!). His article contains very beautiful pictures of Antiqua and more details about it. The pictures of LM1 are from: http://www.mbandf.com/. I recommend a look, the level of “awesomeness” is high there.